On January 1, 1898, the Consolidation Act took effect and gave New York City (NYC) control of the various towns, villages, cities and other municipal forces in what are today’s five boroughs. The result was the creation of the Greater City of New York, with its five boroughs, and one municipal government, seated in Manhattan. Consolidation brought the need for many changes in the department ranging from the abolition & creation of titles to changes in uniforms and station-houses. A board of four police commissioners was appointed; two Republican and two Democratic. 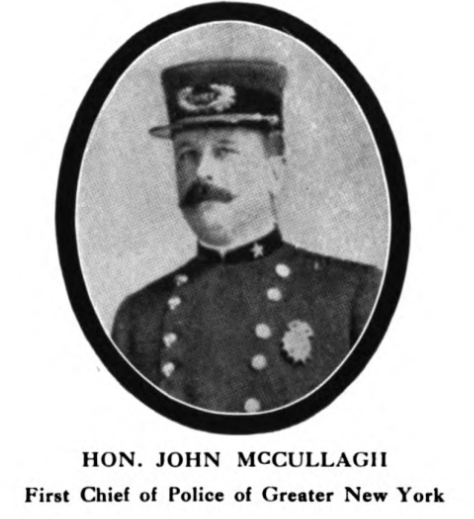 Additionally, John McCullagh became the first Chief of Police of the new PDNYC (today’s title of “Chief of Department”). Chief McCullagh standardized the uniform for the legacy (NYC Municipal Police) officers and for the officers from the over eighteen local police departments that were consolidated into the new PDNYC. The uniform buttons, referred to as the “Consolidation” buttons, were worn. 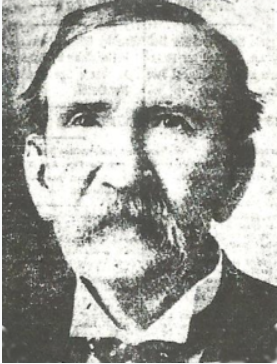 As a result of the political gamesmanship that characterized the era, McCullagh was forced to retire and the high profile, Tammany Hall-connected and corrupt, William S. Devery became Chief of Police. In 1901, Mayor Van Wyck appointed the NYPD’s first solo Police Commissioner, Colonel Michael C. Murphy (1901-1902). Murphy was a former military man who served as the NYC President of the NYC Board of Health. Whether Murphy was pre-disposed to graft or was influenced by the well-heeled Devery remains a mystery. Regardless, Murphy recognized the opportunity to utilize his position for his own financial benefit. Allegations were unofficially made that Murphy took a “cut” on all of the buttons purchased. Unlike Devery whose graft and corrupt practices brought him tens, if not hundreds, of thousands of dollars, Murphy made his money penny by penny. 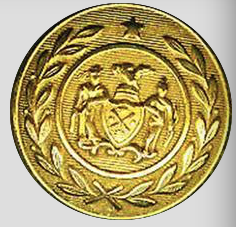 On about June 11, 1901, PC Murphy issued an order directing the 7,500 members of the uniformed force to purchase a new style of uniform button by July 1, 1901. The old buttons were made of brass, and the new of “Prince’s Metal Oreide” and were double-plated (gilded) with 24 carat gold. The new buttons were patented one August 6, 1901. 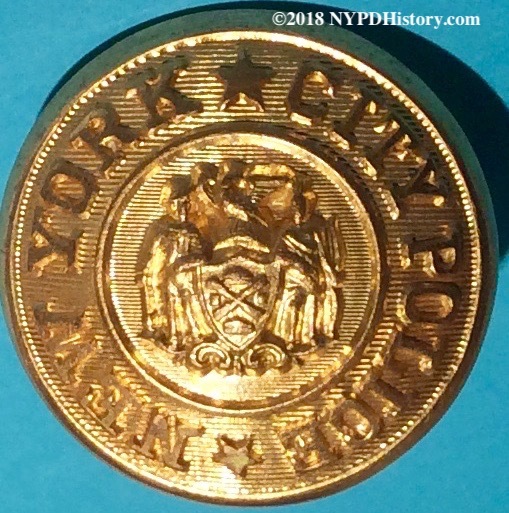 The Seal of the City of New York and the words “New York City Police” were on the face of the new buttons. The Consolidation buttons bore the city seal and had no words. Why the change? PC Murphy stated that he believed that when wearing the old buttons, police officers could not be identified as such and were mistaken for car (streetcar) conductors. No examples of said confusion were offered. Immediately, the members of the force were irate, not only because they were forced to pay for the buttons themselves, but because of the comparatively exorbitant cost (15 cents per button) compared to the existing (Consolidation) buttons (7 cents each). One newspaper reported the details of the quantities needed. “Each man needs a blouse and a dress suit. The latter required thirteen large buttons and six small ones. The blouse, four large buttons. A winter suit, which will not be required for a few weeks, will require twenty-two large buttons and six small ones.” The article estimated that approximately 500,000 buttons would be needed. The New York Button Works, located at 256 Canal Street, Manhattan, was for years the supplier of the department’s brass buttons. A representative told a newspaper reporter that he did not know why another firm was chosen or why the cost was so high. One week later, on June 12, 1901, a newspaper reported that PC Murphy denied that a contract had been awarded; that the price of each button would be close to that of the previous button; that the two-piece button was designed so that the gilt front could be removed for polishing; and that the new method of fastening the buttons to the uniform was better than the old. Officers had their doubts. In the first week of July 1901, it was disclosed that the Patentee was Mrs. Dudley Phelps, the wife of an official with the U.S. Custom House and that the cost would be 4 cents for each of the 53 buttons required per officer. Mr. Phelps was politically connected. 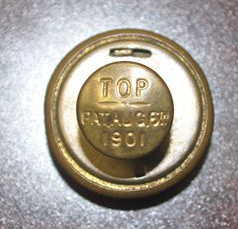 On January 31, 1902, PC John N. Partridge (1902-1903), stated that he had “not heard from a patrolman or any other officer in the department who has a good word to say for the button” and that it was his position that the new buttons were more expensive and inferior in quality to the old. As a result, PC Partridge issued an order, pending the outcome of a hearing with the manufacturer, doing away with the Murphy Button and replacing it with the Consolidation Button. The proprietor, Thomas G. Knight, told a reporter that he opened the business earlier than usual the next morning and that he saw a man holding a shiny object in his hand. Mr. Knight claimed that the man approached him, grabbed both of his wrists with great strength and told him to forget that he ever saw him. Mr. Knight claimed that he was intimately familiar with the design and composition of the buttons worn over history by the department. He pointed out a dent in the button that he claimed was caused by Chief of Police Devery’s biting on it with a broken tooth on his left side. To read the full article, click here. A .pdf will open in a new browser tab. 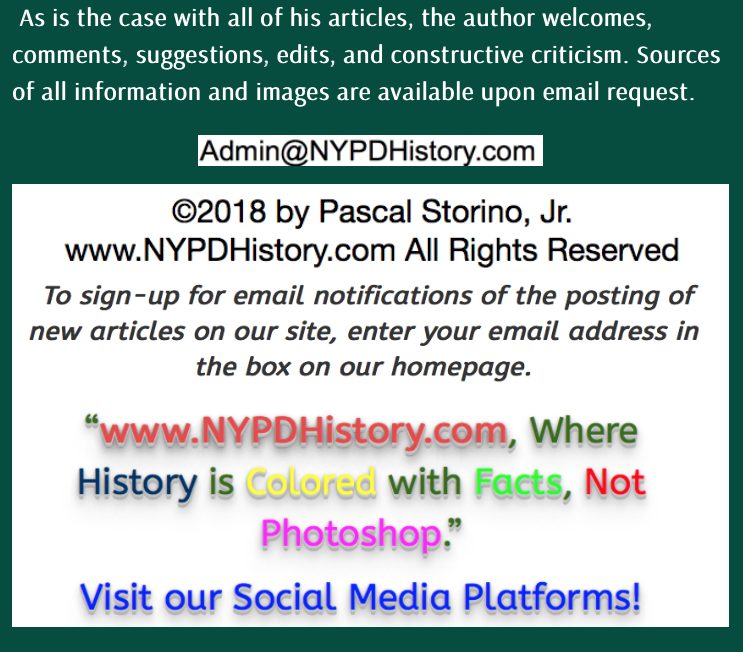 On January 24, 1902, Police Commissioner John C. Partridge (1902-1903) issued an order that dispensed with the Murphy Button and re-authorized the Consolidation button, which preceded that of Murphy’s. In addition to the corrupt manner in which the Murphy button was adopted, they were below par on quality and design. Officers complained that the front and back pieces of the two-part buttons came apart easily and that a sharp shank on the rear damaged the uniform’s cloth. Officers were not reimbursed for the cost of switching back to the Consolidation button and for those officers who held onto the old Consolidation buttons, there was no additional cost to the officers. More than 3,000 Murphy buttons on-hand by the department as well as those in possession of private tailors were returned to the manufacturer. In 1889, renown surgeon Dr. John B. Murphy invented a device to facilitate the feeding of patients with serious digestive disorders that prevented them from eating by mouth. The device, a tube inserted into the abdomen, was operated using a button on the tube. 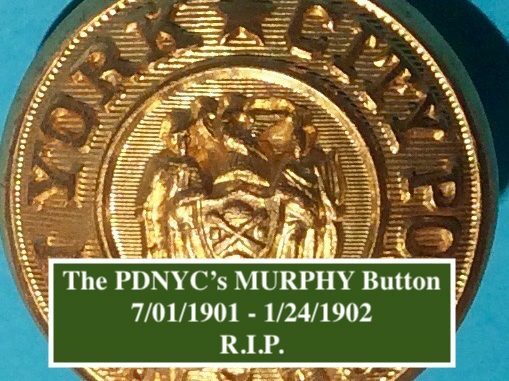 This button was named the “Murphy button.” One news source incorrectly attributed the naming of the button to Police Commissioner Murphy, who had the tube implanted by Dr. Murphy. Fake news. The Consolidation buttons bore the city seal and had no words. On January 24, 1902, PC Partridge issued an order that dispensed with the Murphy button and re-authorized the Consolidation button, which preceded that of Murphy’s. This short-lived button should make the dating of period portrait photos easier for the collector and explain the apparent gap int he use of the Consolidation button. During his tenure, PC Murphy did not leave a lasting legacy, short of being forever connected with the politically influenced adoption of a poor quality, expensive, brass uniform button.